Ultimately, how you handle it depends on your trust level with the client. The act of asking for and receiving a project deposit isn’t just about the money. It signals a client’s mental commitment and therefore functions as a final part of the sales process, including a point for negotiation. The deal ain’t done till the deposit check clears. A person who hasn’t hired or worked with freelancers may not be aware that it’s common practice for us to request a deposit. It’s your responsibility as a businessperson to educate them. The benefit to them is that you’re committed to their needs and can immediately start work. I don’t do business with anyone who doesn’t want to put down a deposit without a really good reason, because it’s a major no-pay/slow-pay warning sign. There are exceptions, however. For example, it can be difficult for big, bureaucratic companies that aren’t nimble but have a tight deadline. I’m going to assume a Fortune 500 is good for payment in full at the end. That’s a risk that I probably wouldn’t take with a smaller company, startup, or first-time author, however, especially if they mention tight budgets. It also makes a difference if someone found me through a trusted referral source vs. blind inquiry from my website. The former has a vested interest in making the person who referred them look good. Important: That’s not to say I won’t ask for a deposit, only that I may be more flexible about terms. On a small project—a few hundred dollars—I might ask for a larger percentage as a deposit. If I’m getting the sense that it’s a semi-squirrelly client, I’ll definitely ask for a larger percentage (if I decide to work with them at all). Personally, I don’t require a deposit once a client has a proven track record of paying. I’m not recommending that course of action for everyone, simply saying that’s what I do! If it’s a particularly high-dollar or long-running project for a long-term client, I may request a partial payment at the halfway point or elsewhere. My better clients will usually offer before I even ask. I will request a deposit from existing clients who have had payment challenges in the past. It provides leverage in case they start to revert to flakiness. Above all, I never look at deposits as “well, at least I’ll get paid something” in case a project goes sideways. Thinking of deposits as a kill fee is a weak mindset. I always want to complete a project to the client’s satisfaction and get paid in full. Thinking of #freelance project deposits as a kill fee is a weak mindset. Final thought: At the beginning of a relationship, you’re setting the tone for what happens in the future. Conversely, your prospective client will be displaying behaviors that aren’t likely to change. 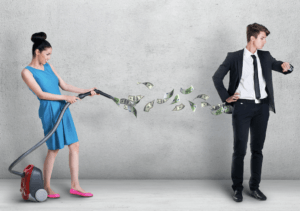 Freelance project deposits can serve as a red flag…or the beginning of a mutually respectful and beneficial business partnership. 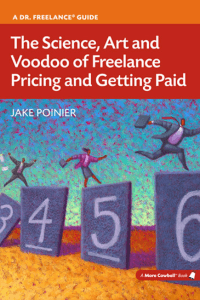 The Science, Art and Voodoo of Freelance Pricing and Getting Paid offers a more detailed explanation of how to crunch the numbers, formulate persuasive estimates, and give yourself more leverage in negotiations with potential freelance clients. 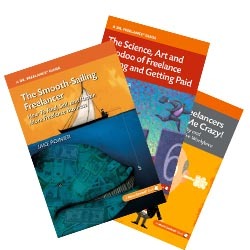 Already read it and found it beneficial for your freelance business? I always appreciate reviews on Amazon and Goodreads—thank you in advance!